Person 1: As a corporate leader, have you ever wondered if you could go back to college again to learn and unlearn your concepts again? Because back in your graduation days you didn’t know what was necessary for a corporate life; and now at your work, you feel that what you learned during your college days was not necessary. Person 2: You’ve just finished college and want to take up MBA but unsure if it’s the right thing to do. Person 3: I want to experience how it feels studying at one of the world’s best institution. A unique opportunity to don the hat of a student, sit alongside the elite from the corporate world, best management colleges, and many zestful creative minds. 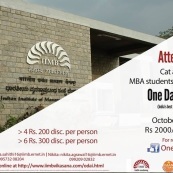 An action-packed day with trademark IIM aspects such as Harvard case studies, Lectures from world class management gurus, Group assignments, Surprise quizzes and a good amount of fun (IIMB style). By the end of the day, you will be drained yet enriched like never before. Feeling excited already.Wait,,,!..this is not even the best part. The entire proceeds from the event will be donated Karunashraya, s our NGO partner for this year’s edition of One-day @IIMB. Karunashraya helps patients live without pain, and in dignity and peace till their journey’s end. Now you can leave with both an enriched mind and soul.